The CSIRO Total Wellbeing Diet is Australia's favourite weight-loss program and has inspired thousands of Australians to lose weight and improve their overall health. 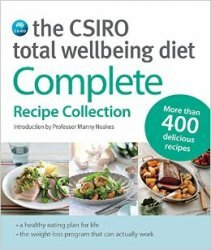 And to celebrate 10 years since the Total Wellbeing Diet was first introduced to us, we've gathered together more than 400 CSIRO recipes together in one volume. You'll be able to enjoy all of these healthy, mouth-watering dishes for breakfast, lunch and dinner, with plenty of options everyone in the family will enjoy. These are all the must-have recipes in one bumper collection - handy for those already using the diet or a delicious introduction to a healthy eating plan for those trying the diet for the first time. Lose weight and boost your vitality while enjoying the pleasures of good food. About the Author The Commonwealth Scientific and Industrial Research Organisation (CSIRO), Australia's national science agency, has been dedicated to the practical application of knowledge and science for society and industry since 1928. Today the CSIRO ranks in the top one per cent of world scientific institutions in 12 out of 22 research fields. CSIRO Food and Nutritional Sciences conducts research into human health, including disease prevention, diagnosis and innovative treatment.